Living in a fishbowl isn’t as fun as you might suppose. Sure, you get a lot of attention but, sometimes, it isn’t the kind you were hoping for. Sometimes, you wish that when you fail, every now and then, no one would see or care. How do you deal with the pressure of achieving “perfect family” status all of the time? How do you make sure the inside of the cup matches its exterior? How do you discern when you are making it, and when you’re falling short? What do you do when your family doesn’t qualify for the cover of the next “Perfect Christian Family” magazine? At some time or another, all of us have considered what it must be like to be really famous. I mean, famous to the point where you can’t leave your home without being recognized by the masses. It may seem glamorous to some, but the weight of such a lifestyle would soon become crushing. Face it, most of us can’t deal with the unwanted attention we receive now! All of us struggle from time to time with keeping a proper perspective in the midst of curious onlookers. I can’t speak for your family, so I’ll share a few thoughts from inside my fishbowl. When you grow up in a family that publishes books and national publications (as I did), which are committed to upholding Godly standards for families, you can be assured that you will be watched. Every word uttered, or written, is critiqued by thousands. My wedding to my wife was pretty high-profile, with our wedding story appearing the next week in the Arizona Republic, and later in the Wall Street Journal and many other publication and videos. Within weeks of being married, my wife and I were speaking at conferences together, telling the story of how God put us together in marriage. We didn’t ask for the media attention, it was just the path the Lord had chosen for us. For better or for worse, we are noticed. We are scrutinized and examined from every angle. Not to be presumptuous, but I would wager (just an expression, please don’t write) that your family is under inspection as well. Maybe it’s on a smaller scale, but, it exists just the same. How do you deal with it? We want to strive to reach the standard of perfection God has commanded, but we mustn’t live our lives based on the expectations of other people. The biggest struggle in this area is to maintain proper perspective. We must keep in mind what perfection is, how we discover it, and what to do if we fall short. How do people generally respond to the standard of perfection? In my experience, there are a couple reactions. We often rebel against such a yoke. Autonomous humans want to be their own God. They want to make their own rules. They don’t want any external imposition. Allow me to give a few examples. When I attend Christian conferences, I like to sit in on as many of the other speakers as I can. Sometimes, my workshop schedules prohibit this, but I like to check out the ideas of others. One session I attended featured a woman speaker addressing other parents. After a few minutes, she made the statement, “I’d like us to look at the ‘Proverbs 31 woman.’” The lady in front of me leaned over to her friend and said, “I hate that ‘Proverbs 31 woman’!” I laughed out loud at such an impromptu statement, but her remark was actually quite telling. I’ve heard dozens of people comment on how they hate magazine and book covers graced by “perfect” families. Every child smiling, every hair in place, and everyone in matching outfits (which are clean by the way). One lady told me, “Those images don’t reflect where I live. I have rowdy children and peanut butter on the walls.” Even if those pictures don’t reflect our personal experience, why do we rebel against them and despise them? Is it because we believe the cover family is being hypocritical? Or is it because we fear they may be genuine? When we do seminars people often approach us with questions about their children. Mothers tell us how their children are failing, then they turn to us and say, “But, you wouldn’t know anything about this. Your children are PERFECT!” The people who make these statements don’t know us. They wouldn’t know if we were “perfect” or not. They just assume because we are on the platform telling people about reaching for a Godly standard, we must be super-human. We get really dirty looks from some attendees who say, “So, are you always this nice to each other?” There is an obvious disgust, not only of our family, but, of anyone who tries to call families up to a higher standard. From their comments it is clear that it isn’t phoniness they dislike, as much as it is legitimacy. If they could prove we were hypocrites, they could excuse their irresponsibility, and failure, to reach the standard. They’d be happier to find out that we’d just had a big fight on the way to the seminar, than to learn that our public image matches our private life. Now granted, our family is not perfect, just as your family is not perfect. We have our fair share of shortcomings, failures, sins and character flaws. However, we really do try to live out the life of Christ everyday in our home. This kind of flippant abandonment of holiness and Godly standards of living is eating away at Christian homes. Without treading on too much theological ground here, it is faulty logic to say we should abandon our pursuit of holiness as unattainable. (“Nobody’s perfect.”) Hundreds of thousands of people play golf, knowing they will never hit a “hole-in-one” on each attempt. “So why try?” Why not purposely hit the ball in the woods? Why not land it in the pond or sand trap? In every field of life, we strive to be the best we can be. We mustn’t fall short in our highest calling. We mustn’t sin to enable “grace” to abound. That is nothing more than cheap grace, not the costly grace that our Savior bled and died for. How Should We Respond to the Standard? As believers, we have an obligation to be faithful to that which we know. The more we discover about the personality and character of God, the more obedient we must be. Scripture tells us we must actively live out our faith. Our actions prove what we really believe. Why Must We Strive For Perfection? Secondly, we have an obligation to walk uprightly, setting an example for the believers. (1 Tim 4:12) People need encouragement from others who are also striving for these heavenly goals. Like it or not, we represent Christ. That was the calling we received. We have a holy obligation to be faithful with whatever platform God has given us. We must never be like modern sports “heroes,” who say, “I’m not going to be everyone’s mother! I’m no role model.” You are an ambassador for Jesus Christ, whether good or bad. We must run to, and embrace, the chance to be an example for others. We mustn’t shrink back or hide in fear. Recognizing our need to be “Salt & Light,” it’s tough to deal with the reality that we’re shining about as bright as a candle in the wind and tasting rather bland. However, we can’t abandon our post. Deserters will have no part of God’s Kingdom. It’s important to remember that (hopefully) we are all growing. Most of us have matured a lot in the last five years. We should see things more clearly and do things better than we used to. We can’t let our failures and foibles spoil what God wants to do through us. We need to keep short accounts with God. Keep the slate clean. If we do sin, “We have an advocate with the father; Jesus Christ the righteous.” (John 2:1) Confess your sin, repent and move on. There is too much work to do, and we should not allow our inadequacies or mistakes to keep us ineffective. Just as we weren’t born adults, knowing all things, we have to grow spiritually as well as physically. I believe strongly in making spiritual landmarks as they did in the Old Testament. One of the purposes of these landmarks, besides marking private property, was to supply a long-lasting reminder of something important. It seems whenever God did something remarkable among His people, they built an altar, or made a monument. They didn’t want to forget. We should do the same thing in our families. No, we shouldn’t pile up hundreds of rocks in our backyard! (The neighbors are already worried enough about us!) But, we should make spiritual landmarks whenever God gives us a significant victory in our home. Write it down in a journal. Get up in a meeting or family gathering and testify of some specific instance of God’s goodness to your family. Make sure we don’t forget. How Should We Relate To Other Imperfect People? The tough thing about getting the victory over a major hangup, is that we often lose compassion for those struggling with the very thing we just escaped. We found the answer, and we feel they should receive the same revelation we did. Maybe they will, but it might take some time. It took us a while. We agonized over it for months, maybe years. If we need to confront a brother or a sister regarding a shortcoming in his or her life, we should only do it if we are motivated by love. Don’t shoot the wounded. They are probably already feeling guilty about missing the mark, and they need encouragement to make the hurdle, not rejection or judgment. We are to speak the truth (as hard as that can be some times) but, we do it only in love. We need to see the sinfulness of their hearts, in light of the sinfulness of our own hearts. Only the grace of God enables us to walk uprightly. Without grace, none of us could live right. Let’s take advantage of the evangelistic opportunities the Lord sends our way. Because our family is homeschooling, we stand out in many ways to others. People take notice of us and the way we live. We want them to see that what makes our families close, and why we really do love each other, is not because we homeschool, but because of Jesus Christ and how He has changed our lives. Don’t hide behind closed doors hoping no one will see the real you. If there are character flaws in your family, they need to be dealt with. Sin needs to be exposed. Be willing to hear the good, and the bad, from those in your church or support group. That is what accountability and discipleship is all about. Of what benefit is a support group where everyone is acting or pretending? Why not be real? Share your heart with a close circle of trusted friends. If you’re not doing well, don’t lie. If your children are not in a good place, spiritually speaking, don’t hide the truth. Ask for prayer, and be willing to change if need be. If you have a rebellious teenager, don’t cover it up and make excuses. Face it honestly. Only then can you be a true help to them. If someone confronts you about the behavior of one of your children, thank them for caring enough to let you know. Stop living with the guilt of skeletons in the closet. Clean it out! Get rid of it, and start over. We need covenant brothers and sisters who are willing to walk with us on this road of discipleship. I’m not sure where our family would be without Godly people who are willing to love us unconditionally. Sometimes that love motivates them to rebuke us for moral failure. Other times it moves them to embrace us in our tears or to pray for us when we face seasons of doubt. If you have someone like this in your life, thank God and never take them for granted. If you don’t have these faithful friends, try being that for someone else. If you are living in obedience to God, He will never allow your life, in the long-term, to be 100% output without supplying friends to encourage and uplift you. Remember the key is to walk together in integrity. “And we, with unveiled faces all reflect the Lord’s glory, are being transformed into his likeness with ever-increasing glory, which comes from the Lord, who is the Spirit.” (2 Cor. 3:18) Throw away the masks! Allow the transformation to take place. Carnality is like a cancerous growth; the longer you ignore it the faster it kills you. Allow yourself to be accessible even to the members of your own household. After all, our goal is family-based discipleship. If your husband, wife, parent, sibling or child sees a character flaw in your life, repent and change. If someone mentions a problem they have observed with one of your children, don’t be defensive or combative. Welcome inspection from your spiritual authorities, church family, small group, etc. Set An Example For The Believers. The Apostle Paul told the church at least three times to be imitators of himself (see 1. Cor. 4:14; 11:1, Phil. 3:17). We see this pattern also in 1. Th. 1:6, 1 Tim 4:6, & Heb 6:12, as well as Heb. 11. It is not wrong for others to look to our behavior as a guideline for holy living. Are we not to be imitators of Christ? Therefore, in our conduct, speech and all other aspects of our life, we must uphold God’s Standard of perfection in absolute purity. We have received no other calling. This is truly the call which we heard from Christ, to give all we are, for all He is. Let us embrace it, and rest in it. Our world is in need of love. It is also in need of leaders who aren’t afraid to stand up and be counted. We can truly represent Christ in this Post-Christian culture. As the Body, we need each other more now than we have at any other point in American history. The world needs us. Christ is calling, will we answer? 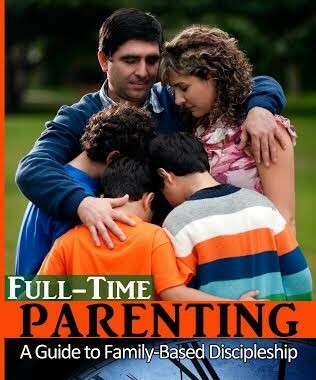 This is an excerpt from Israel Wayne’s book, Full-Time Parenting: A Guide to Family-Based Discipleship. Copyright 2012, All Rights Reserved. You can get a print edition HERE and an e-book version HERE. Congratulations on baby #8! Wow! Thanks as always for your voice of reason to home educating movement. I think the underlying issue here is the power of the Holy Spirit it really help us overcome. Without the power of God’s Holy Spirit, we just struggle constantly to improve ourselves rather than enjoy his fellowship as we walk out our faith struggles with the Holy Paraclete alongside. THAT is GRACE! So true, Teri! So true. This article was really helpful. It must have been very difficult to be put under the spotlight with correcting your toddler like that. I really liked what you said about the correction needing to be done in an attitude of love, I have realized recently how many people, as you said, are already smarting under their mistakes and there is no need to stab the wounded, I’m only eighteen but I’ve done that enough to be quite ashamed of myself. I don’t have a family yet and though I know intellectually that if the Lord sees fit to send me one that it will be far from perfect, yet I still struggle with the idea which my heart is unwilling to accept. I often struggle with the problem you mentioned about hanging on the words of the supposed experts, imagining that they have no problems and thinking there is something wrong with me since I’m not like that. Thank you for reminding us that no one is perfect, we are all sinners and that our job is to strive for perfection not mourn over the fact that we’re not there yet.